Yee-haw! Southern Fried Exploitation was box office gold during the 1970’s, a genre that usually had one or more of the following elements: race cars, moonshine, redneck sheriffs, scantily clad country girls, shotguns, and/or Burt Reynolds . 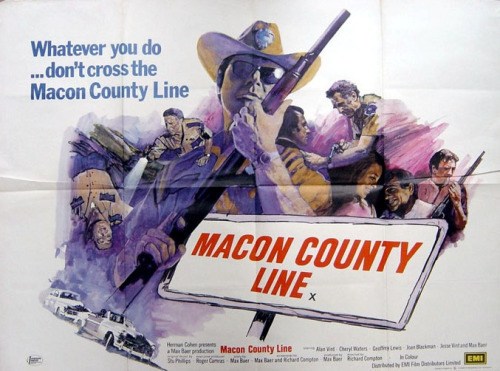 One of the foremost practitioners of this art was Max Baer, namesake son of the heavyweight boxer and erstwhile Jethro Bodine of TV’s THE BEVERLY HILLBILLIES, who scored a surprise hit when he produced, wrote, and costarred in 1974’s MACON COUNTY LINE.